Yisrael Kristal survived Auschwitz and lived out his life in Israel. Yisrael Kristal receives his certificate last year for being the world's oldest man. THE WORLD’S OLDEST man has died. Yisrael Kristal was one month short of his 114th birthday and has passed away in his home country of Israel, according to the country’s media. AFP reports that, since he was an observant Jew, his family could not be reached on Friday evening, the onset of the Jewish sabbath. “Yisrael Kristal… died on Friday a month before his 114th birthday,” news website Haaretz has reported. Kristal’s amazing life began in what is modern-day Poland on 15 September 1903 and saw him survive the Auschwitz concentration camp. His wife and two children were killed in the camp but Kristal survived, weighing just 37 kilos at the end of the war. He lived in Poland during the First World War up until the Nazi occupation of the country when he was taken to Auschwitz. After surviving the war he moved to Israel where he lived for over six decades and remarried. When Kristal was born in the town of Zarnov, the Wright brothers’ were preparing for the first powered and controlled aeroplane flight which occurred three months later. The world’s current oldest person is 117-year-old Jamaican woman Violet Brown who was born on 10 March 1900. 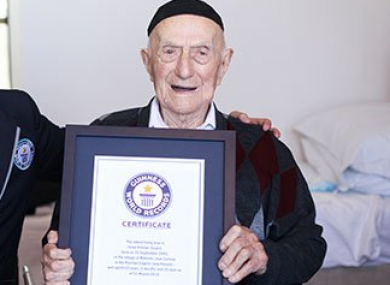 Email “The Holocaust survivor who became the world's oldest man has died aged 113 ”. Feedback on “The Holocaust survivor who became the world's oldest man has died aged 113 ”.